Apple started its advertising company as early as 1976, when Steven Wozniak contacted Mike Markkula. Mike Markkula was a retired Intel Marketing Manager, and Steven Wozniak asked him to provide the funds for the very first Apple Computer publicity. From 1977 to 1981, Apple used the “Regis McKenna” agency for its advertisements and marketing. Regis McKenna’s advertising operations division appeared later (in 1981) acquired by “Chiat/Day” advertising agency. “Chiat/Day”, which itself merged later in 1995 with TBWA Worldwide company, a part of the global marketing group Omnicom. Back in 1981, “Chiat/Day” acquired Regis McKenna’s advertising operations. Apple ran the initial advertisement for its first computer, Apple II, in July 1977. The advertisement consisted of a two-page spread ad titled Introducing Apple II, and was published in “BYTE” magazine. The first brochure, was entitled “Simplicity” and both the ad and brochure pioneered “demystifying” language intended to make the new idea of a home computer more “personal.” The Apple II introduction ad was later run in September 1977 issue of “Scientific American” magazine. At “Regis McKenna” advertising, the team, assigned to launch the Apple II, consisted of Rob Janoff, Art Director, Chip Schafer, Copywriter and Bill Kelley, Account Executive. It was Rob Janoff who came up with the Apple logo with a bite out of it. The original design was an olive green with a matching company logotype, all in lower case. But when Steve Jobs saw the logo, he insisted on promoting the colour capability of the Apple II by putting rainbow stripes on the Apple logo. In the company’s letterhead and business card implementation, the rounded “a” of the logotype echoed the “bite” in the logo. This first logo was developed simultaneously with an advertisement and a brochure which was printed for distribution at the first West Coast Computer Faire. Then, for a number of years, up to 1990, all of Apple’s packaging for the Apple II series looked similar, featuring lots of clean white space, the Motheer Tektura font and showing the Apple rainbow logo prominently. In the early 1990s, Apple Computer changed the fonts used on the package to the Apple Garamond font. In 1982, “Chiat/Day’s” Art Director Brent Thomas and Steve Hayden came up with an idea. They decided to do an advertising campaign based on the timely tagline “Why 1984 will not be like 1984” (reference to George Orwell, of course). The agency sent the idea to a number of clients, including Apple. With Apple, they proposed a print ad in the Wall Street Journal promoting the Apple II machine. Towards the end of 1982, Apple computer refused the proposal, and the idea was filed away until the spring of 1983, when Apple’s marketing team changed their mind and started working on the launch of the new ad, which was scheduled for January 1984. The result eventually became the famous 1984 Apple’s commercial, which aired during the third quarter of the Super Bowl XVIII. The original Macintosh mimicked imagery from (as mentioned above) George Orwell’s 1984. The commercial, directed by Ridley Scott, was first aired nationally on January 22, 1984 during a break in the third quarter of the “Super Bowl”. The unnamed heroine was played by Anya Major. 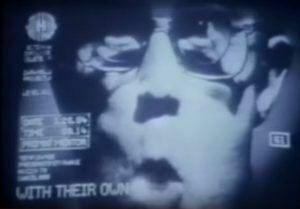 She was wearing orange shorts, red running shoes, and a white tank top with a Picasso-style picture of Apple’s Macintosh computer, running through an Orwellian world to throw a sledgehammer at a TV image of Big Brother played by David Graham (they say it was an implied representation of IBM). In 1985, the new “Lemmings” commercial was aired at the Super Bowl, but it was a significant failure compared to 1984. In 1988, Apple computers released a short film titled “Pencil Test” to showcase Macintosh II’s animation capabilities. Later, in the 1990s, the “Think Different” campaign introduced a new slogan, linking the company to famous social figures such as John Lennon and Mahatma Gandhi. Also in the 1990s, Apple launched the “What’s on your PowerBook?” campaign which featured celebrities describing how the PowerBook helped them in their businesses and everyday lives. During 1995, Apple ran an infomercial called “The Martinetti’s Bring Home a Computer” to promote Apple’s “Performa” line. In the ad, the fictional Martinetti family brought home their first computer and attempted to convince the father to keep the computer by using it for various educational, business and other purposes. The same year, Apple responded to the introduction of Windows 95 with print ads and a television commercial. Next, popular and successful advertising campaigns included the 2000s “iPod People”, the 2002 “Switch” campaign, and the “Get a Mac” campaign which ran from 2006 to 2009. However, some of the publicity met with controversy from consumers and artists. For instance, people criticized the “iPod People” campaign for copying a campaign from a shoe company called ‘Lugz’. Another instance was when photographer Louie Psihoyos filed a lawsuit against Apple for using his “wall of videos” imagery to advertise for Apple TV without his consent. Apple debuted a new series of ads which became very popular during the 2012 Summer Olympics opening ceremony.This ad, aired during television broadcasts, was produced by ‘TBWA/Media Arts Lab”, and portrayed people in everyday situations being assisted by an employee from the Apple’s “Genius Bar”. Curiously enough, this line of ads were widely criticized, with some, including former “TBWA/Chiat/Day” Creative Director Ken Segall remarking that it portrayed Apple customers as clueless. So the ads stopped airing after two weeks (but some reports claimed that they were only intended for a short run). The ads were subsequently removed from both, Apple’s official Website and YouTube channel. Apple 1984 Super Bowl Commercial Introducing Macintosh Computer (HD). Video uploaded by Robert Cole on June 25, 2010. Iconic 1984 Apple Computer Macintosh commercial conceived by Chiat/Day and directed by Ridley Scott was nationally aired on television only once – during the 3rd quarter of the 1984 Super Bowl football game.